Trip 1) I was fishing for Fast Break in the morning and the fish were eating. I fished with the Hoffman family (Ray, Joe, and Bob). 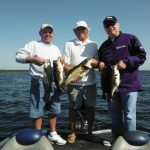 They caught a lot of fish, around 30 in 4 hours and a 7lber and a couple of 5 lbers. Here is a picture from the day. 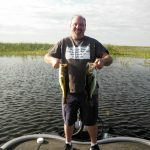 Trip 2) I fished my second trip for Bass Online on the south end. With north winds the last couple of days the water is pretty messed up color wise. Robert Pelletier fished very well in the tough conditions. We had to move around a lot but caught 20. Here is a picture from the day.